Sai Satcharitra Tamil Mp.3 Audio - Free Download. Today we are happy to share with you Sri Sai Satcharitra Audio Mp.3 CD in Tamil Language. We had previously posted Links of Sai Satcharita Parayan Audio CDs in English, Hindi, Kannada & Telugu Languages. This Album has been Published by Sai Sansthan, Shirdi. Sri C Subramanian & Abhinaya Creations have recorded this Cd. As the Download Speed at Sai Sansthan website is very slow due to excess usage & gets most of the time with incomplete download, we are sharing a Copy of the same to benefit Sai Devotees. 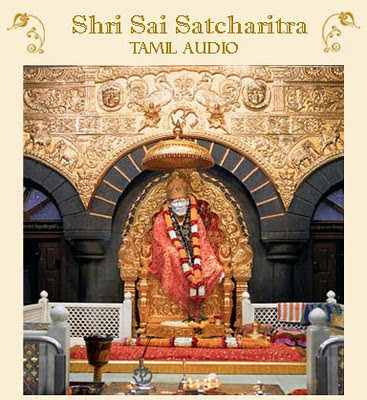 Sai Devotees can now Download their favourite Sai Satcharitra - Tamil in Audio Mp.3 Format. As Sai Baba's Name & Leela are spreading day to day, this is a Small effort to Spread his Miracles in the Form of this Audio Mp.3 Cd in Tamil Language. 1. Kindly download all the parts before unzipping this Album. 2. Use Win Rar to Unzip this Mp.3 Album. 3. This Album is password protected to have a Count of Sai Devotees Downloading this Album. Thanks to Sai In My Breath: Sai Satcharitra Tamil Mp.3 Audio - Free Download.